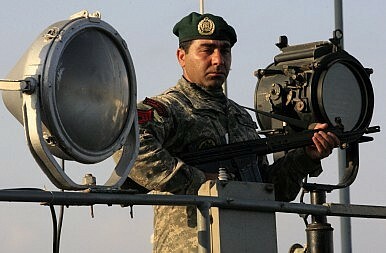 The Iranian navy has a growing presence in Asia, a development many in the region could welcome. Iran has a significant history of long-distance seafaring in pursuit of trade with Asia. The presence, to this day, of wealthy and influential families of Iranian descent in some Asian countries, notably India and Thailand, is lingering evidence of early Iranian maritime ambitions in the region. Tehran’s recent foreign policy has been aimed mainly at countering the isolation brought about through international sanctions, by prioritizing official contacts with a relatively small number of friendly nations, and demonstrating that Iran retains credible international reach. The Iranian leadership is, therefore, keen to demonstrate its country’s continuing blue water capability. Over the past seven years, Iran’s offshore naval force, the Islamic Republic of Iran Navy (IRIN), has undertaken about 30 increasingly ambitious overseas deployments. IRIN’s focus is firmly on offshore waters, as coastal operations are the responsibility of the Islamic Revolutionary Guard Corps Navy (IRGCN), which has a large inventory of fast attack craft armed with torpedoes and missiles. For many years Tehran’s leaders favored the IRGCN, and IRIN was something of a poor cousin. Now, though, a change of policy has allowed the IRIN star to rise in the Iranian political firmament, with increased funding enabling the service’s capabilities to grow significantly in recent years. Older, Western-built frigates, corvettes and fast attack craft have been upgraded, as have IRIN’s Russian-made Kilo diesel-electric submarines. In addition, a program of indigenous construction of both surface and sub-surface warships is underway. Under this program, a Moudge-class frigate, Jamaran, was completed in 2010. Armed with both air defense and anti-shipping cruise missiles, this warship is very active in both Iranian and more distant waters. At least two more vessels in this class, which is an Iranian upgrade of IRIN’s aging, British-built Vosper frigates, are being built, as are a number of small and midsize submarines. Particularly important IRIN assets are its three large, armed, helicopter-capable fleet replenishment vessels. These are the force multipliers that enable the service’s overseas deployments. Since 2008, IRIN task groups have been deploying on training, defense diplomacy and anti-piracy missions in Middle Eastern waters, and in the lawless seaways off Somalia. Senior U.S. Navy officers have commented favorably on the professional and courteous manner in which the service conducts its operations. Now Tehran has extended its naval horizons, with a new emphasis on Asian waters. The perception, widespread in the West, of a world united in its efforts to thwart Iranian nuclear ambitions is not wholly accurate. Certainly, in pragmatic Asia, there has been little evidence of unbridled enthusiasm for the application of sanctions against Iran. In Hong Kong, for instance, Iran National Day has continued to be marked by receptions, speeches and the publication of dedicated newspaper supplements. When the sanctions regime was at its height, the maintenance of oil revenues was of supreme importance to Tehran. Crucially, Asian nations, notably India, China, Japan and South Korea, remained prime customers for Iranian crude oil. To some extent, cultural and diplomatic exchanges between these countries and Iran continued in parallel with this trade. Iran showed determination, cunning and ingenuity in ensuring that the export of its crude oil to Asia continued. China provided discreet assistance by facilitating the transfer of a number of aging tankers to Iranian ownership, while the Japanese government reportedly provided risk cover for Japanese tankers that could not obtain insurance for cargoes of Iranian oil. Moreover, Indonesia’s Batam Island, just off Singapore, was reportedly used as a transhipment hub by Iranian very large crude carriers, with Iranian oil being transferred to smaller ships for onward transport to Asian destinations. The Iranians themselves reportedly employed a convoluted web of covert activity, involving front companies, multiple changes of Iranian-owned vessels’ names and registries, and the transmission of names and destinations of bogus ships. Concurrently, Iran let it be known that it saw IRIN as being in the vanguard of efforts to maintain international maritime security, including in Asian waters. In a speech in 2013, for instance, IRIN commander Read Admiral Habibollah Sayyari stressed the importance of the north Indian Ocean and southeastern Asia to Iran, because of the commercial vessel traffic through the Straits of Hormuz, Bab el-Mandeb and Malacca. He also announced that two IRIN ships had deployed to the Chinese port of Zhangjiagang. The arrival of IRIN warships at the port was significant on more than one front. First, Zhangjiagang is a major naval port, and is the home base of China’s South Sea Fleet. Second, it is a key node for China’s oil trade. Lastly, the stopover fuelled speculation that the task group might extend its voyage to include a visit to long-time Iranian ally North Korea, although there were no reports that this did in fact occur. No joint Iran-China naval exercises were reported, but there were well-publicized contacts between senior personnel from both navies. Since the introduction, late last year, of limited sanctions relief in exchange for Tehran’s agreement to accept constraints on its nuclear program, sales of Iranian crude to Asia have boomed, and both Japan and South Korea have reportedly made big, and much-needed, payments to Iran in recent weeks. The introduction of a more liberal sanctions regime was closely followed by an IRIN deployment—including, unusually, a Kilo-class submarine—to India. The visit featured discussions on future naval cooperation between senior Indian and Iranian staff. In another strategically significant development, while the IRIN warships were docked in Mumbai, Sayyari, the IRIN commander, was invited to an international maritime security symposium in Jakarta. While there he reportedly concluded agreements on future naval cooperation with the commanders of the Indonesian Navy, and the Japan Maritime Self Defence Force. This February then saw the unveiling of a feasibility study of a joint Iran-Indonesia $3 billion Java oil refinery project. The plan is for the refinery to process 300,000 barrels of Iranian crude per day. Nearer home, IRIN is planning to ramp up its presence in the Caspian Sea, following the discovery, in 2012, of a new oil field in waters claimed by Iran. The Moudge-class frigate Damavand is at an advanced stage of construction at Bandar-e Anzali on the Caspian. IRIN is also reportedly intending to deploy light submarines to the sea, which is currently dominated by Gepard-class frigates from Russia’s Caspian Flotilla. The scene may be set, then, for a regular Iranian naval presence in Asian waters. That might well enjoy significant support from Islamic communities within Asia. Regional desire for Islamic involvement reportedly led to Indonesian and Bangladeshi warships being assigned to the multinational UNIFIL force that conducts anti-arms smuggling operations off Lebanon. Even beyond Islamic communities, the presence of Iranian naval vessels could prove rather less controversial than some might fear. Asian governments are, in general, comfortable with a benign foreign naval presence, which is seen as a stabilizing influence in an area that features both vital international shipping lanes and a mass of bitterly contested maritime territorial claims. Certainly Washington is trying to strengthen its Asian naval presence, while the Five Power Defense Arrangements continue to bring together warships of Australia, Malaysia, New Zealand Singapore and the U.K. for exercises in Asian waters, 43 years after its inception. Foreign warships help deter piracy and other maritime crime, and as was demonstrated last year in the Philippines, they can make a substantial contribution to humanitarian relief efforts in a region prone to natural disasters. Trevor Hollingsbee is an independent defense and security analyst, with more than 1,000 articles published, since 1989, in Asian, Australian and European journals and newspapers.